Welcome to Wishing Well Gifts located in Brick, NJ. 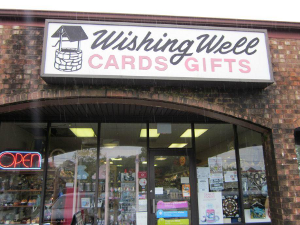 Wishing Well has been in the full-service card and gift business at this location since 1987 providing the utmost in customer satisfaction. A few recent pictures of the store are shown on the 'Pictures' page. Please email us at sales@wishingwell-gifts.com or call us at 732-920-6663. In addition to being a full-service card and gift store, we also sell wedding invitations and personalized holiday cards. You can also view our FaceBook page. We accept the major credit cards shown below.